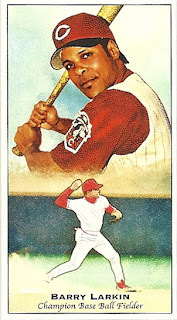 All About Sports Cards: Cincinnati Reds Standout Shortstop, Barry Larkin, Elected To The National Baseball Hall Of Fame, The Only Player On The Ballot To Make It. Cincinnati Reds Standout Shortstop, Barry Larkin, Elected To The National Baseball Hall Of Fame, The Only Player On The Ballot To Make It. Cincinnati Reds standout, Barry Larkin, a 12-time All-Star, nine-time Silver Slugger and three-time Gold Glove winning shortstop, was elected to the National Baseball Hall of Fame by the Baseball Writers' Association of America. Larkin, who was in his third year of eligibility, received 495 votes, 86.4-percent of the total of 573 ballots, including nine blanks, that were cast by BBWAA members with 10 or more consecutive years' service. Players must be named on 75 percent of ballots submitted to be elected. This year, 430 votes were required. A Cincinnati native, Larkin played 19 seasons for the Reds and batted .295 with 2,340 hits, including 441 doubles, 76 triples and 198 home runs. He drove in 960 runs, scored 1,329, stole 379 bases and had more walks (939) than strikeouts (817). Larkin became the first shortstop to join the 30-30 club when he had 33 home runs and 36 steals in 1996. He was voted the National League Most Valuable Player in 1995 and hit .353 in the Reds' World Series sweep of the Oakland Athletics in 1990. The only other players that came close to the 75 percent threshold were pitcher Jack Morris with 382 votes (66.7%), first baseman Jeff Bagwell with 321 (56.0%) and reliever Lee Smith with 290 (50.6%). Players may remain on the ballot for up to 15 years provided they receive five percent of the vote in any year. There were 13 candidates who failed to make the cut this year (30 votes), including 12 of the 13 players who were on the ballot for the first time. The only first-year candidate who received sufficient support to remain was outfielder Bernie Williams with 55 votes (9.6%). Two-time American League MVP Juan Gonzalez got 23 votes (4.0%) and fell off the ballot in his second year of eligibility. Larkin, 47, will be inducted into the Hall July 22 at the Clark Sports Center in Cooperstown, N.Y., along with the late third baseman Ron Santo, who, as we told you previously, was elected last month by the Golden Era Committee. Also to be honored over Induction Weekend will be Bob Elliott of the Toronto Sun with the J.G. Taylor Spink Award for baseball writing and television analyst Tim McCarver, the former major league catcher, with the Ford C. Frick Award for broadcasting.